Kiruna Wagon has been commissioned to refurbish 50 bottom dumpers for raw material transport between LKAB sites. 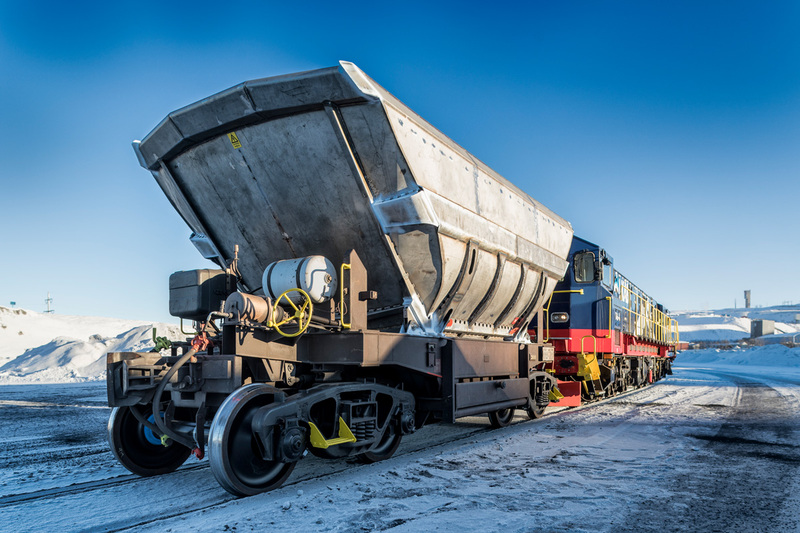 “This project calls for a lot of customisation, since we’re renovating and reusing undercarriages from old UADK wagons and fitting them with new baskets,” says Pawel Karas, Project Manager at Kiruna Wagon. The new basket is developed by LKAB, based on experiences with the basket of ore wagon F050, and is a challenging and innovative project in itself. Besides having steeper ends – 50 degrees rather than 40 degrees – the main new feature is that the entire basket will be made of Duplex Stainless Steel. Together, these modifications will ensure complete discharge of many types of goods. The basket shell is made of Duplex Stainless Steel, allowing good long-term discharge and reliable bottom emptying of a wide range of bulk materials. Photo: Fredric Alm. The Duplex steel guarantees a stainless surface on the basket, and good discharge properties in the long term – also for materials that can be hard to release. Thanks to the steel’s high strength, the weight and thickness can be reduced, making it a cost-effective option for mining transportation. Good weldability and malleability also make it ideal as part of a construction. The material in all the outside reinforcements and bars is normal steel. Welding stainless onto ‘black’ material presents a new challenge for the workshop. In the bottom section or ‘skirt’ of the basket, the new Duplex steel is welded onto the reused, black steel parts. To minimise the risk of goods getting stuck, the hatches are coated with Matrox® wear plastic, which has been specially developed for bulk material handling in the mining industry and has outstanding strength in demanding applications. “This project is a great example of how it really is possible to renew existing wagons using modern, high-performance materials,” says Pawel Karas. The wagons will be completed during the spring and delivered to LKAB Malmtrafik at the end of June 2018.